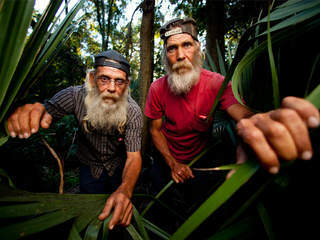 Mike and I love the History Channel show "Swamp People". It is one of the few shows we DVR on a weekly basis and have grown to look forward to it. We each have our favorites, mine being Troy (left), the singing "King of the Swamp" who is famous for saying , "Choot 'em, choot 'em!" and Mike's favorites being the hilarious Guist brothers, Mitchell and Glenn (right). Call it ironic, or just plain sad, but as I was writing this post (entitled Swamp People) this morning and listening to the news in the background I learned of Mitchell's unexpected death. I know he will be missed by our household and many other viewers. RIP Mitch! As for our swamping adventure this weekend, we headed out to Lake Toho (short for the official Indian name Tohopekaliga meaning "we will gather together here") for an air boating extravaganza. Most of us had never been on an air boat before and decided to try out Wild Willy's Airboat Tours. There are many different companies around Central Florida that offer competitive prices, but we chose Wild Willy's based mainly on their easy to navigate website, personalized tours (only 6 people per ride) and fun lime green boats. We definitely weren't disappointed. Their customer service was very professional and once we arrived, there were plenty of signs marking the way making it very easy to navigate. After getting all checked in, we had a few minutes to relax on the deck with a cold one while we waited on our boat to arrive from the previous tour. The view was beautiful and the overcast skies made it not too hot, which was a plus. As we boarded our boat we were so excited to find out that our captain was actually, "Wild Willy", the owner. He was so friendly and has a real passion for nature. My nature boy (Mike) was definitely in his element. Captain Willy stopped periodically to give us lessons about the local ecosystem including these "bubble gum eggs" that eventually turn into gigantic apple snails. We also got to see some gators in the wild! These little guys were only about 3 years old but can still pack a punch if you get too close! We also came upon a momma Sand Hill Crane that was sitting on her nest. Even though we pulled pretty close, she didn't flinch and stayed very calm. We see them all the time in our neighborhood, but I have never seen them up close. Such cool birds! Our tour lasted an hour and included fun hair pinned turns and even a 360 degree turn. The coolest thing about air boats, in my opinion, is how smooth they are. It's almost like you are sliding over the water and wasn't rough at all. My friend Lynn, who gets motion sickness, wasn't even phased. Whew! Upon returning to the dock we headed inside to hold Sergio. He and Cricket are the resident baby gators that are quite the celebrities around the office. They are even having a calendar made! And, since it was the last run of the day, we were even treated to a ice cold brew by Captain Willy. Awesome experience, great friends and good fun made for an amazing Sunday Funday! Wild Willy's* definitely gets two thumbs up. *For more information or to see what people are saying about Wild Willy's, visit Trip Advisor or check out their Facebook page. Looking forward to our tour soon! Great photos!